If you support Manchester United, Watford or just generally enjoy Premier League football be sure to head over to Coral Casino ASAP. 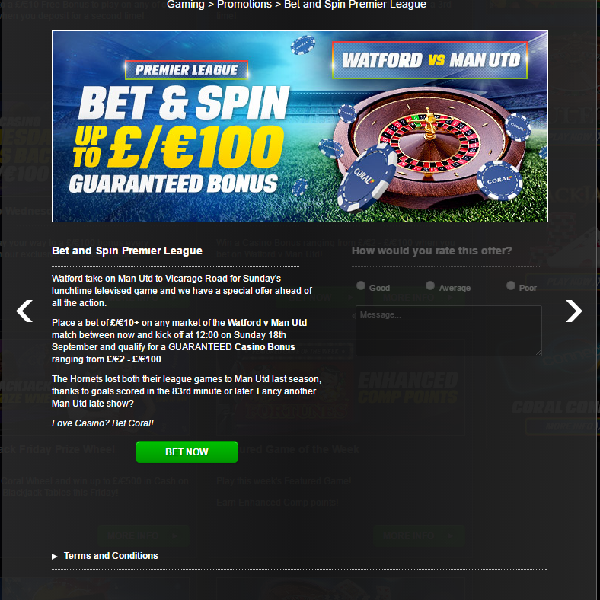 If you place a bet of £10 on any of the markets for Watford vs Manchester United before the game begins tomorrow at 12:00 then you will qualify for a guaranteed casino bonus of between £2 and £100. This means that regardless of what happens in the game you are sure to have some extra cash to use at Coral Casino next week. If you win your bet as well then you’ll really be raking it in. This is a great chance to make this weekend’s football even more exciting and ensure that you have plenty of casino funds for next week. Head over to Coral today and place your bets on the game.